The article was published by Dr. Adrian C. Plunkett, Consultant Intensivist at Birmingham Women’s and Children’s Hospital. 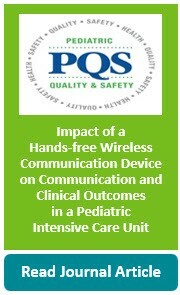 Dr. Plunkett launched an initiative to implement the Vocera system in the PICU and designed a research study to measure the solution’s effect on communication efficiency in 2014. The hospital completed more than 200 hours of direct time-motion observation and a 50-member staff survey, both before and after deployment of their Vocera solution. "It’s a personal interest of mine to improve the satisfaction of our colleagues because the more we improve our working environment the more timely care we can provide for our patients,” said Dr. Plunkett in a case study that discusses the hospital’s results in detail. After deploying the Vocera system, the hospital recorded dramatic reductions in response times, which are detailed in the case study.